The Mahoning Valley Flight Crew took a trip to RL Lipton Distributing Co. to check out some ales for the winter season. As snow flurries swirl and heavy coats come out of storage, it’s the perfect time for craft beer aficionados to shift gears to winter seasonals. Good timing is key in many of life’s endeavors. It’s especially important to the Mahoning Valley Flight Crew. We prefer not to drink craft beers before their time, or after. When Ed Carissimi, vice president and general manager of R.L. Lipton Distributing Co., invited the Flight Crew to sample an offering of some of the latest winter seasonals last week, our ears perked up. The timing was just right. As we entered Lipton’s Austintown warehouse, we saw more than 300 stock-keeping units of craft beer stacked high on the shelves. We instantly felt butterflies in our stomachs. When we saw the huge wall of cases and kegs of craft beer built just for us, we acted like children with visions of sugarplums dancing in our heads. When it came time for sampling, we were on an emotional high. Lipton has expanded its craft beer offerings of late. Goose Island (Chicago) was its first craft brand. Then North Country (Slippery Rock, Pa.) came along. Now, the distributor has dozens of craft brands, including Paladin (Austintown). 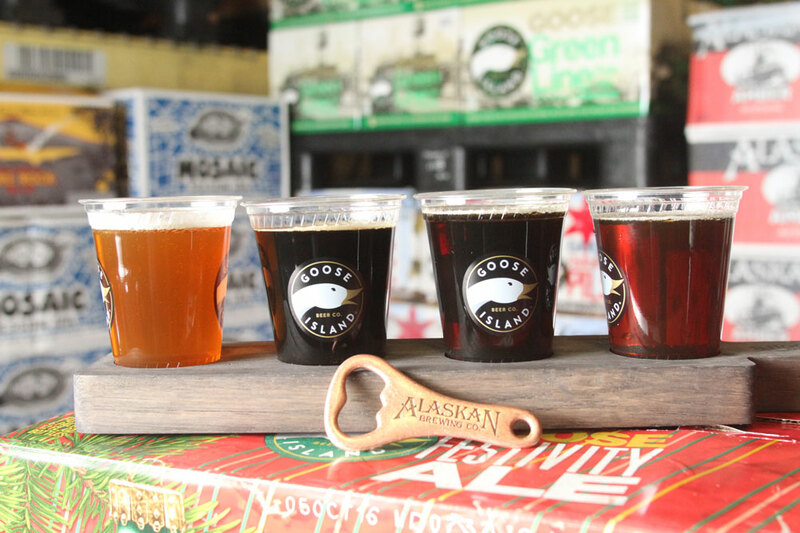 Seasonal offerings from those breweries were lined up for the Flight Crew to try, as were craft beers from Alaskan (Juneau, Ala.), Breckenridge (Littleton, Colo.), Kona (Honolulu) and Yuengling (Pottsville, Pa). A cornucopia of porters, stouts, holiday ales and an IPL awaited us on a special-built sampling table made of wooden pallets. This ale is brewed in the style of an English Olde Ale. It balances the sweet, heady aroma of spruce tips with the clean, crisp finish of noble hops. Rich, nutty chocolate notes, malty, roasted caramel flavors, fuggle hops and an amber color make this winter ale a must have. An oatmeal stout featuring Elk Mountain Farms and fuggle hops, this seasonal brings together notes of chocolate and roasted malt with a smooth body and rich finish. A good example of a Baltic porter, this craft beer is big, complex and flavorful. It’s bigger, richer, sweeter and more alcoholic than even a robust porter. A crisp, refreshing Hawaiian-style pale ale, its signature copper color results from the unique blend of specialty roasted malts. It has a pronounced citrus-floral hop aroma. This frosty, malty winter ale has been brewed since 2005, and is available from November through January. The other winter seasonals we tasted were Breckenridge Christmas Ale, Goose Island Festivity Ale, Paladin Imperial Knight and Yuengling India Pale Lager (IPL). R.L. Lipton is now offering craft beers from Millersburg Brewing Co. in Millersburg, Ohio, including the French Ridge IPA, Lot 21 blonde ale and the Panther Hollow vanilla porter. Watch for a Mahoning Valley Flight Crew blog entry soon about it on vindy.com.